Upon retuning from a week of vacation I find that my garden has been found by a baby rabbit. The cutest little bunny I have seen! I watched through the window as he hopped around in my cold frame (which is now a hot frame) and he very nicely chose the weeds to nibble on. Grasses and pigweed. He avoided the melons and cucumbers and broccoli. 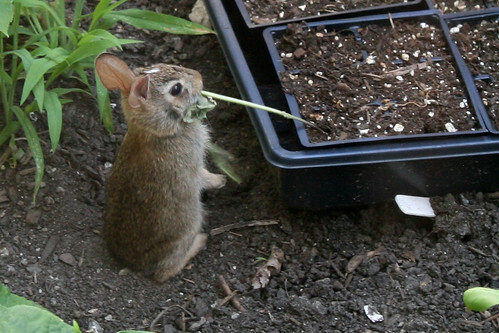 He didn't eat the sunflower seedlings. 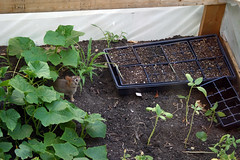 He did eat the two baby soy bean seedlings still in plastic trays - oh well. Now this is definitely a failed crop. I thought it was better to get this cute photo than two bushes of edamame. That is SO adorable!!! =) When I had rabbits (escaped domestic, breeding like mad) before I figured it out, I thought "Gee, I've hardly got ANY weeds! How great!" Then my veggies started disappearing and I figured it out. Very cute, though! Funny pic! Certainly is a cute little rabbit. There may be time to do a second sowing of soy beans. The summer is suppose to be a warm one. They are so cute. But they ate my peas!!!! I may as well replant the soy beans. I will soon post my soy bean (sad) story. 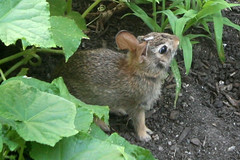 We have quite a few wild rabbits in our yard, but they haven't really bothered my raised beds (knock on wood). They stick mostly to the grasses and weeds so I haven't had to do any bunny eradication yet. The dog does help keep the population manageable (she occasionally catches and kills baby bunnies - I know, a bit sad). The kids do love watching the bunnies. They are very cute! Hopefully they don't become Big Trouble. They aren't as destructive as woodchucks are they? He's gorgeous :) Thank you for sharing. How polite of him to just single out the weeds. Cute, when they aren't in *my* garden ;) We do have a lot of rabbits around, but they don't seem to bother with the garden. I even took down my rabbit fence. But I do have two dogs roaming around, so that probably helps. Lovely Bunny-baby. Young animals always seem to have such a joy of new life about them, everything is interesting and in the case of bunnies investigated by eating. Your veggies look great, we picked our first yellow courgettes today, just about to be sauteed for dinner! Too cute! I have a mole who inhabits my garden. Enjoy the little critter until it invites its siblings to join him!